Last night, I dreamt that I was seated on the floor and looking at the feet of a saint - it was of Sri Narayani Amma. She was seated in a chair with Her orange sannyasin robe and smiling. Behind me were devotees who were looking at Her. One thing I've always wanted to do in my heart the next time I saw Sri Amma was to do paatha puja. I've told myself mentally, "Remember, next time if I get the opportunity I must do paatha puja to her as if it were Murugan's feet." So in the dream, I remembered this desire of mine and I looked at Her feet and saw they were resting with the left foot over the right foot. Beneath the heel of the right foot was an object I immediately recognized. 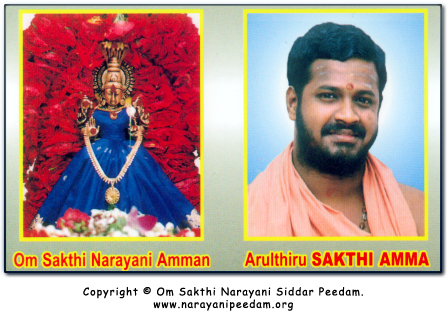 It was of the Sri Chakkra that Sri Narayani Amma graciously gave to me back in 1997, when I first met Her (to which I do Skanda-Jyothi Puja to). As I saw the Sri Chakkra, I immediately remembered the idol of Lord Muruga (that my wife and I received on our wedding day) that sits in our puja room on top of the Sri Chakkra (see below). As I was thinking of Lord Muruga in the dream, I then opened my eyes and amazingly appearing in front of me at Sri Narayani Amma's feet was the exact same Lord Muruga statue - it was placed how I have it in the puja room - sitting on top of the Sri Chakkra! Amma's feet had moved together just behind the yantra. I was so happy and I immediately started doing the Skanda-Jyothi Vidhana Raja Upachara Puja in my dream. I recall chanting all the slokas, and mantras and feeling so elated and content doing this service for Lord Murugan, the Sri Chakkra, and Sri Narayani Amma. I then awoke. I wondered if the dream was just that - just a dream or if it really happened. I didn't tell anyone about this dream - not even my wife. I didn't think much more about the dream as I realized I was getting late for work so I did my parayanam in the morning by singing Kanthar Anubhuthi for Lord Murugan and then went to work. As my wife and I were driving to work, around 7:30am, I saw in the early morning sky a beautiful rainbow (see picture below). Unfortunately, the camera that I used to take this picture doesn't do justice as the rainbow was much more clearer and larger when I saw it with my own two eyes. I wasn't able to take a good picture while driving - but to see a symbol of Sri Skanda and have a dream of Him the night before, what are the odds of that?! I immediately chanted Bhagavan Sri Skanda's mantra three times in my heart and remembered that the dream I had was maybe not just a dream. It was Lord Murugan's grace given in the various forms that He chooses to take - of Himself, of the Sri Chakkra and of Sri Narayani Amma. All forms are His and He is all Forms. Om Jaya Jaya Mahavira Bhagavan Sri Skanda Namo Namaha! As if to convince my doubting mind, Lord Muruga showed another sign. While I was driving with my wife to go shopping I was waiting to make a left turn at the light, which was red. As I was stopped awaiting the light to turn green, I was glancing at the traffic light and wondering when it will turn green. Then I noticed something above the traffic light, it was another bigger rainbow! I was surprised as it appeared in the clear blue sky free from any clouds. I looked at it and told my wife who exclaimed,"See Murugan is showing you His sign again." To which, I replied, "Ok, how about I ask one more time? 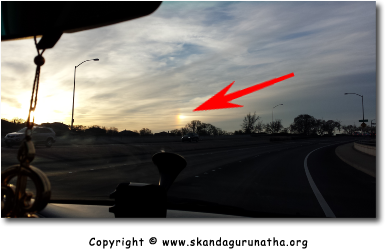 Muruga, ok if you show us another time, there is no way that THREE rainbow sightings all together coincinding with the dream I had this week was a mere coincidence and just a dream." My wife said,"Aren't the rainbows you've seen enough?" So for valentine's day, my wife took me to a restaurant. We ate some delicious vegetarian cuisine for lunch and came home. Unfortunately, the food was so good that we both fell asleep. I awoke later in the afternoon with my wife and she said, "Let me take you to a movie." So we went to an early evening show around 8pm. As we sat waiting for the movie to start, we were munching on some buttered popcorn and watching the trailers. The first trailer that came as we sat and glanced at the screen showed a big colorful rainbow. I immediately closed my eyes and chanted Sri Skanda's Mantra thrice in my heart. When I opened my eyes, the rainbow no longer appeared with the trailer and my wife said, "Ok, I hope that answers your question now. Murugan showed you three times." I replied, "Three times too many for a fool like me to not believe it the first time." Maybe it just wasn't a dream.